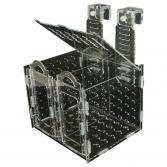 Brief Description: This collapsible acclimation/utility box comes in 4 different sizes: Small, Medium, Large and X-Large. 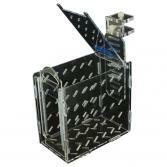 The adjustable hanging bracket can support 3/4 in. 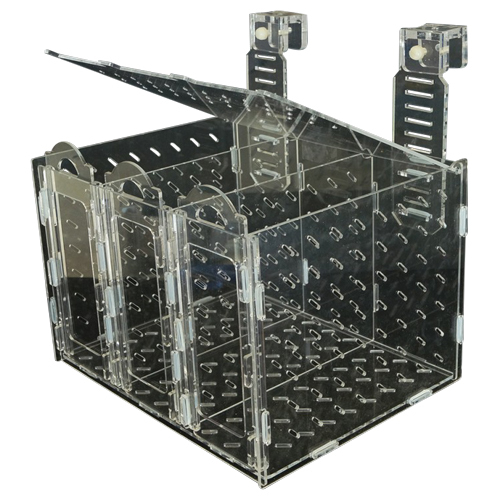 glass/acrylic panel and is compatible with rimless and euro braced aquariums. 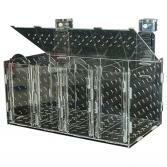 Notify me when "Collapsible Acclimation Box [Small]" is re-stocked. Dimensions: 4" x 6.75" x 7.12"
Door Opening: 2.5" x 4.12"
Dimensions: 8.62" x 7.12" x 7.5"
Dimensions: 12.5" x 9.62" x 9"
Door Opening: 2.37" x 5.87"
Dimensions: 15.87" x 8.62 "x 8.37"
Door Opening: 2.25" x 5.12"